Sample AngularJS/HTML5 project with source code. PHP and SQLite/MySQL backend. We will use the DayPilot AngularJS Scheduler plugin to create the main reservation grid. Angular will watch all changes in $scope.schedulerConfig and $scope.events objects. If a change is detected it will update the UI. For introduction to using the Scheduler with AngularJS see also the AngularJS Scheduler Tutorial. The AngularJS Scheduler supports predefined timeline scale units, such as "Hour", "Day", "Week", "Month", "Year". The timeline unit can be set using .scale property. However, we will use a manually-adjusted timeline that will display time cells from 12:00 to 12:00 (noon-noon) instead of 00:00 to 24:00 (midnight-midnight). That corresponds to the usual Hotel check-in and check-out time. You can adjust the check-in and check-out time in the getTimeline() function. The Scheduler displays one room per row. By default the row header shows just one column with the resource (room) name. We will load the rooms from the server using Angular HTTP call to "backend_rooms.php" PHP script. The Angular $http.post method automatically wraps the callback method in an $apply() block so we don't have to notify the framework about a property change. We will use onBeforeResHeaderRender event to set the content of the additional columns and customize the row header CSS (depending on the room status). It is also possible to load the column data directly from the JSON source (.resources property) but we will use the client-side approach. The Navigator will let users switch the current month. Whenever the user clicks a certain date, onTimeRangeSelected event is fired. If the selected date is within the current month, the Scheduler will scroll to the selected date (we update the scrollbar position using scrollTo property). If the selected date is in another month we will load the events for the new month and update the view. Reservation status text ("New", "Confirmed", "Arrived"). Guest name, check-in a check-out day: "Mr. García (11/2/2015 - 11/7/2015)"
The users can filter rooms using a drop down list with room types (single rooms, double rooms, etc.). We will watch changes of the roomType using Angular $watch mechanism. 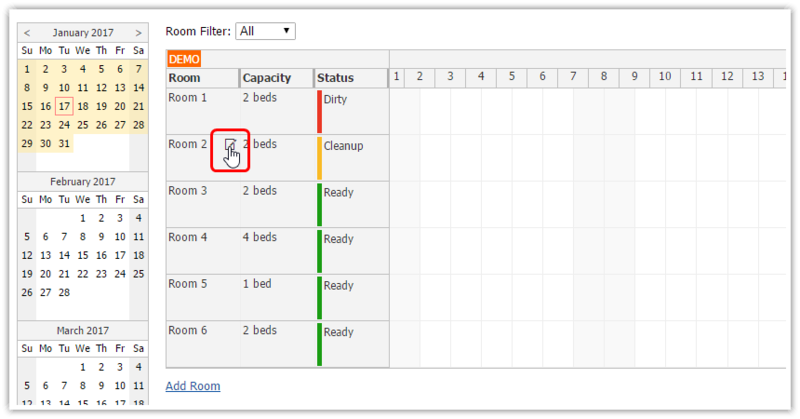 Changing the room type will reload the resources using the specified filter. The demo uses a special AngularJS directive to format and parse the date value between model and view. If the value specified by the user in the view can't be parsed (DayPilot.Date.parse() method returns null) an error message is displayed ("Invalid date"). 1. The sample projects uses SQLite backend by default. The database file (daypilot.sqlite) will be created automatically in the root directory if id doesn't exist. 2. You can also use the MySQL backend by replacing _db.php with _db_mysql.php file. You need to modify the settings at the beginning of _db_mysql.php according to your configuration.